Whether you’re in the mood for casual dining or elegant meals, we’ve got it all from fresh seafood, fantastic barbecue, burgers, pizza, and island-style cuisine. Use this restaurant guide to help you decide where to eat in Ocean Isle Beach, NC! Whether you are looking for Seafood, Steaks, Italian, Jamaican Restaurants you’ll find it all at Ocean Isle Beach Restaurants! If you haven’t been to Antonio’s Deli, Pizza & Grill yet you need to come find out what you’ve been missing! Established in 2013, Antonio’s offers take out and deliver or… you can always sit next door at your favorite local bar, Chubby Buddha, inside or outside on one of two outdoor decks. Antonio’s offers NY Style pizza, deli subs, and more (see our menu below). OPEN 7 DAYS A WEEK! Hours are Sunday thru Thursday 11am until late night. Friday & Saturday Nights until 2:00am! We always offer delivery when open. “We Ain’t Just Great Pizza!” NEW MENU FOR 2018! 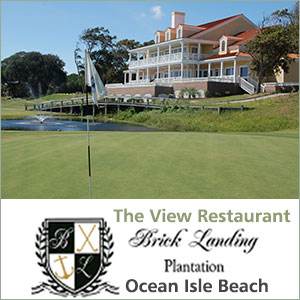 The View at Brick Landing is the only restaurant in Ocean Isle Beach, NC situated on a premier golf course overlooking the Intracoastal waterway. Coastal residents and visitors of both North and South Carolina routinely visit The View at Brick Landing to enjoy fresh seafood, exciting American traditional dishes, and breathtaking views. What makes The View at Brick Landing so unique is not just its spectacular location, but the premium cuisine. With a focus on fresh and local cuisine, The View at Brick Landing brings a new and exciting take on dining out to the Ocean Isle Beach area. With a wide range of dishes to satisfy all types of patrons, Brick Landing has become a staple of Ocean Isle Beach dining. From the deck, you can enjoy a breathtaking view of the 18th fairway, that boasts panoramic views of the Intracoastal waterway. Enjoy the sights and sounds of the Carolina coast from our luxurious dining rooms or multiple patios. The Brick Landing Plantation features a locally renown Sunday Brunch. Hundred from near and far join us on Sunday for their local favorites. The brunch features crisp hickory smoked bacon, maple flavored sausage link, corn beef hash, jumbo shrimp with chorizo gravy, cheese-filled blintzes, cheddar cheese grits, hash brown casserole, assorted bread, assorted pastries, assorted biscuits, fresh fruit display, yogurt parfait station with seasonal fresh berries and granola and much more! Included in the brunch are made-to-order pancakes and french toast. Come by and hear what the locals are raving about. 910-754-2745 info@bricklandingcc.com. 1882 Goose Creek Rd SW, Ocean Isle Beach, NC 28469.